Yesterday, Google announced an important update to their advertising policies on ticket resale. From January 2018, event ticket resellers will need to be certified before they can advertise through AdWords. The policy will apply globally, across all accounts that advertise ticket resale. Needless to say, this appears to be a positive development. It should have ramifications on the controversial marketing practices of secondary ticketing platforms. More importantly, it should result in consumers finding it easier to locate face value tickets sold by authorised ticket sellers. FanFair research from July 2017 (“Google, we have a problem…”) illustrated how the likes of Viagogo, StubHub and Get Me In! 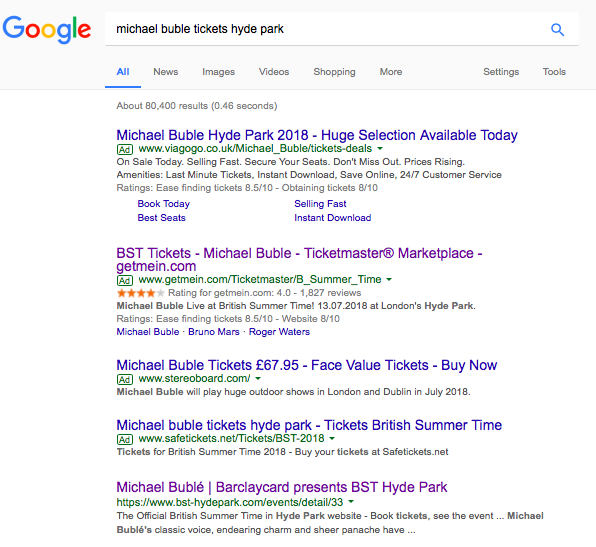 could be misleading would-be ticket buyers through their online marketing practices – paying to top search results with tickets listed by touts, even when face value tickets from authorised sellers are widely available. Investigating ticket sales for 100 upcoming UK tours – by artists ranging from Metallica and Cliff Richard to Lulu and Run The Jewels – FanFair found that a secondary ticketing website had paid to top Google rankings on 77% of occasions. In the recent AudienceNet / Music Ally report “Ticked Off”, commissioned by FanFair, 43% of respondents said they used Google as their first port of call to search for tickets, while 52% had difficulty distinguishing between authorised primary sellers and unauthorised secondary sites. Addressing this issue has been a real priority for our campaign. Details of Google’s updated policy can be found here. – resellers must also tell customers that prices may be higher than the face value (the price offered by the primary provider). This is a very welcome development, with potential to make the ticket-buying process far less complex for consumers. The recent “Ticked Off” report highlighted that a significant proportion of would-be ticket buyers use Google as their first port of call, while FanFair’s own research has illustrated the extent to which Viagogo, StubHub and Get Me In! use paid search to dominate Google rankings. They make little indication that they are secondary ticketing platforms. As a result, fans have been systematically directed towards touted tickets, even when primary inventory is still available from authorised ticket sellers. We are pleased that Google have listened to concerns on this issue, and have acted in an assertive manner and on a global basis. We look forward to seeing further details – but this move should be a major step forward in cleaning up the secondary market, as we anticipate more regulatory and legislative action to come.